Faye Chadwell: It's my pleasure to introduce Dr. Joseph Orosco who will make a few comments and introduce our keynote speaker tonight, Dr. Mian. So Dr. Orosco joined the OSU faculty in 2001. He received his Ph.D and M.A from the University of California, Riverside, and his B.A in philosophy; we were just talking about this, from Reed College right here in Portland. His primary area of interest is social and political philosophy, particularly democratic theory and global justice. He teaches classes in American Philosophy and Latino, Latina and Latin American thought, with an emphasis on Mexican culture. He is the director of the Peace Studies program at OSU, and because of his interest in peace studies he's a frequent speaker on issues of peace, nonviolence and the lives of Cesar Chavez and he has done speaking across the country, so we're really pleased that he could join us tonight. We thought he was an ideal candidate to introduce our lecture, our speaker tonight. So thank you again for coming, and over to you Dr. Orosco. Joseph Orosco: Thank you Faye. Good evening ladies and gentlemen. My name is Joseph Orosco, I'm an associate professor of philosophy at Oregon State University and I'm the director of the peace studies program there. Since the 1980s OSU has maintained an undergraduate minor in peace studies, giving undergraduates the opportunity to get a degree in the study of the roots of conflict, the origins of war and the power of nonviolent conflict resolution. We are one of the oldest peace studies programs within the public universities of Oregon and we are honored to be invited here today to join in this celebration. OSU, in my opinion, is truly the Peace University of Oregon. In addition to the peace studies program, OSU is the home of the Ava Helen and Linus Pauling archives, a treasure trove of history that documents the life and work of two of the world's most significant peace and justice activists in the 20th century. OSU also sponsors the annual Ava Helen and Linus Pauling Memorial Lecture for World Peace through the College of Liberal Arts, and finally the Linus Pauling Legacy Award, sponsored by the OSU library and OSU Press. And we're working together now in CLA, hopefully, to start to build an OSU Peace Institute, burgeoning, so we're hoping to continue his legacy of his peace work, complimenting the Linus Pauling Institute of Science. In the 1950s Linus Pauling had a realization, and he explained it this way, quote: "it seems to me that we have come to the time that war ought to be given up. It no longer makes sense to kill 20 million, 40 million people because of a dispute between two nations who are running things, or decisions made by the people who are really running things. It no longer makes sense. Nobody wins, nobody benefits from destructive war of this sort, and there is all this human suffering. And Einstein was saying the same thing, of course. So, that's when we decided – my wife and I – that first, I was pretty effective as a speaker, and second, I better start boning up, studying these other fields so that nobody could stand up and say, ‘Well, the authorities say such and such..." So that is, Pauling decided that he had to expand his expertise beyond chemistry and to learn how to speak authoritatively on issues of nuclear policy and to raise his voice as a concerned global citizen. The Pauling Legacy Award is granted every other year to an exceptional individual who continues the Pauling spirit of excellence in their field, science and promotion of world peace. And this year's recipient is Dr. Zia Mian. Dr. Mian is a physicist who received his Ph.D in the United Kingdom and he has dedicated most of his career to questions involving nuclear energy policy and nuclear weapon disarmament, particularly in Pakistan, his home country, and in India. He currently is the director of the Project on Peace and Security in South Asia and Princeton University's Program on Science and Global Security. 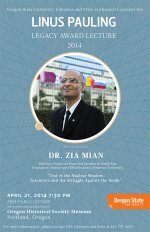 A prolific author, Dr. Mian has published six books on nuclear policy and peace, and written numerous articles, including many of the important reports of the International Panel on Fissile Materials, an independent think-tank of global exports that seeks to reduce the world's stockpiles of key ingredients for nuclear weapons development. He is the co-author of Science & Global—or co-editor; forgive me, of Science & Society, a leading journal of technical analysis for arms control and nonproliferation policy. In following the footsteps of the Paulings, Dr. Mian has tried to make sure to reach out to wide audiences and raise awareness of the grave danger of nuclear war. He has written and helped to produce two documentaries about peace in South Asia: "Crossing the Lines: Kashmir, Pakistan, India" in 2004, and "Pakistan and India under the Nuclear Shadow" in 2001. Of his later film, one reviewer wrote quote: "Pakistan and India under the Nuclear Shadow' was a film which awakens one to the fact that just because the world has lived with the threat of nuclear war, it cannot live with it forever." Ladies and gentlemen, please welcome Dr. Zia Mian. Zia Mian: Thank you very much. I'm honored to be here and to receive this award, and especially the kind and generous introduction. So let me begin by being more specific that I still don't really understand how I got this award. But I'm grateful for it and honored by it and, so thank you all for coming. I want to use the time that I have to try and explain some of the things that have occupied me and the generations of scientists before me who think about what to do about nuclear weapons and how much of that is rooted in the example that Linus Pauling set. And so with that I hope that we can share at least this part of the legacy of Linus Pauling. What's important for me is not just that Pauling was a great scientist but that he took up the struggle against nuclear weapons at a time in American history where unlike today it came at enormous social and political cost. You have to remember, this was the Cold War has set in. there were McCarthyite witch hunts across the United States. People were being dragged in front of the House Un-American Affairs Committee and persecuted and it took enormous courage to speak out and say "look, this is just not how it needs to be." And not just in terms of the United States, but the fact that nuclear weapons were actually a global danger, a threat to human civilization in all its dimensions. And Pauling, I think, was an enormously influential figure, both in the United States across Europe and even the Soviet Union, in setting the example of what the model for a scientist should be when he finds the world in peril. So let me talk today about how Pauling's ideas about the responsibility of scientists resonate with where we are today. And so I'm going to talk first about how scientists took up this idea of responsibility when it came to nuclear weapons and why those ideas are still important today and the situation that we find ourselves with regard to nuclear weapons issues. Focusing on nuclear weapons issues rather than the larger set of issues with which Pauling struggled, because as Joseph just mentioned, Pauling didn't just talk about the nuclear danger, he actually talked about the problem of war itself. That is part of the Pauling legacy that seems to have disappeared. The focus has shifted to just the nuclear weapons part. So let me start with that and I'll try and come back to the larger question later on. One would have thought that if Pauling had been told that the Cold War will end, the Soviet Union will disintegrate, there will be no more communist threat to the west, he may well have presumed that yes, then the nuclear danger would have gone away. And he would have been wrong. Like most people of that generation would have believed that the nuclear danger existed because of the superpower arms race. What we know today, now it's almost 25 years since the end of the Cold War, is that the bomb has taken on a life of its own and that the danger persists regardless of the superpower confrontation. At the same time, five years ago this month in Prague, President Obama has talked about nuclear weapons and he said "they're the ultimate tools of destruction" and argued that as far as the United States was concerned, and I quote: "as a nuclear power, as the only nuclear power to have used a nuclear weapon, the United States has a moral responsibility to act. So today I state clearly and with conviction America's commitment to seek the peace and security of a world without nuclear weapons." Now that's a pretty compelling statement from the President of the United States. But the fact of the matter is that five years later there are an estimated 17,000 nuclear weapons in the world. The United States has about seven and a half thousand. Russia has about eight and a half thousand and the other seven countries that have nuclear weapons share the remaining 1,000 weapons. And so despite that kind of commitment of an American moral responsibility and a willingness to state the significance of American leadership in moving towards a world without nuclear weapons, we actually haven't made much progress in the last five years. Not to say the last twenty-five years. But when I think about how Pauling would have responded to President Obama, one thing that I was struck by is that he might not have been as surprised as one might think by an American president talking about the dangers of nuclear weapons and the need to eradicate them. So in September 1961 President Kennedy went to the United Nations and gave a speech at the General Assembly and some of you may remember. This was the famous Nuclear Sword of Damocles speech where, and I quote, the president said: "Every man, woman and child lives under a nuclear sword of Damocles, hanging by the slenderest of threads, capable of being cut at any moment by accident or miscalculation or by madness. The weapons of war must be abolished before they abolish us." September 1961, that's more than fifty years ago. And it did not come to pass. Instead, under President Kennedy and then under President Eisenhower, who came after, there was a massive nuclear buildup. In the four year period after Kennedy's speech the United States increased its nuclear arsenal by ten thousand nuclear weapons. It went from twenty thousand to thirty thousand. And so it's perhaps no surprise then that if you look at what Pauling was doing at the time, he was standing outside the white House protesting. And so one of my favorite pictures of Pauling is actually Pauling in a protest organized by Women Strike for Peace against nuclear weapons testing, outside the Kennedy White House, and this was in April of 1962. So Kennedy—Pauling protested for two days outside the White House and then went in to have dinner at the White House as part of a group of forty-nine Nobel Prize winners that Kennedy had invited. I think Pauling may have been the only Nobel Prize winner out of the forty-nine that actually took the time to stand outside the White House and exercise his democratic responsibility. It was an amazing public statement. And the picture shows him in his shirtsleeves holding up a big sign, walking the sidewalk, opposing nuclear testing. And it did have its affect. All the years of work that Pauling and other people put into it did lead President Kennedy eventually to sign the Limited Test Ban Treaty. And that was what led to Pauling, in part, receiving the Nobel Peace Prize. But the process by which Pauling got to that is what I want to focus on. And that was that Pauling saw that the need was actually for a social movement, a political movement that brought together scientists and others and the public to engage with the political decision making process. So scientists and physicians warned of the dangers of the arms race and the effects of nuclear weapons. Artists, writers and poets found ways to give expression to the collective human fear about what nuclear weapons meant. And countless people petitioned and marched and protested. And there's an amazing history of this antinuclear movement written by the historian Lawrence Wittner, called The Struggle Against the Bomb. It's a three-volume history of the worldwide movement against nuclear weapons and it really is an amazing—offers an amazing set of insights into how in almost every field of human endeavor people came to struggle against what nuclear weapons meant to the world. And everyone had their reasons for joining the struggle against the bomb. And twenty years after his Nobel Peace prize Pauling actually explained why he did what he did in terms of protesting and organizing and campaigning and collecting the petitions of thousands of scientists against nuclear weapons. Pauling said that all human beings, all citizens have a responsibility for doing their part in the democratic process. But almost every issue has some scientific aspect to it. And this one of nuclear war, or war in general, is if course very much a matter of science. And this meant, Pauling said, "that scientists have a special responsibility." So let me turn now to how scientists took up this responsibility, not just Pauling, when it came to nuclear weapons, and what they've done with this special responsibility. The British scientist and writer C.P. Snow observed in a famous lecture in 1959 that "the scientist has the future in his bones." "The future in his bones." It should be "in his bones or her bones," but he was an Englishman writing in 1959, you know. But "the scientist has the future in his bones." If this is true than the knowledge and fear of nuclear weapons has been in the bones of scientists for a hundred years. Because scientists have been thinking about nuclear weapons for almost as long as they have been doing nuclear science. In the old days it was called atomic science. So when radioactivity was discovered in 1896 and then Marie and Pierre Curie discovered that uranium was radioactive and that the radioactivity was actually a property of the uranium atom itself. It became clear that we were actually looking at something that was a fundamental property of some kinds of material in nature. And it was not long before people started to think about what the energy being released by atoms through radioactivity might actually mean. And so in 1903 Frederick Soddy, the English physicist, thought about this and he warned, and I quote: "the man who put his hand on the lever by which a parsimonious nature regulates so jealously the output of this store of atomic energy would possess a weapon by which he could destroy the earth if he chooses." So in 1903 his warning that if we could find out a way to control the release of nuclear energy, we would possess a weapon by which we could destroy the earth if we chose. But for thirty years nobody knew how to—what the lever was that would allow you to control the release of nuclear energy. And it was actually Leó Szilárd, another giant of twentieth century physics and another classical example of the citizen scientist, a Hungarian Jewish physicist who studied in Germany, ended up as a refugee from the Nazis in first England and then in the United States and lived for some time in Princeton. He was the person who first discovered the nature of this lever that allows humanity to control the release of nuclear energy. And for those of you who are interested, there's a terrific biography of Leó Szilárd called Genius in the Shadows by William Lanouette. But anyway, the—in 1933 Szilárd is crossing the street in London at a traffic light and he came up with the idea of the nuclear chain reaction, the process by which the splitting of one atom can cause other atoms to split, which will cause more atoms to split until you get a runaway chain reaction. And Szilárd straightaway realized that, in his words, "that this could liberate energy on an industrial scale and construct atomic bombs. And so by 1933 he had already realized chain reaction: either make nuclear energy for electricity or make nuclear weapons. And so what was Szilárd to do with this knowledge? So the first thing he did was to try and keep it a secret; that it should not get into the hands of the wrong people. So he hit upon the idea of what he called a conspiracy of scientists. And the idea was that all the scientists who did nuclear physics at the time should agree not to publish their research, and that way it wouldn't get into the hands of the wrong people and they couldn't make nuclear weapons out of it. Because a special fear for Szilárd was the rise of the Nazis in Germany. But he was generally skeptical of what nuclear science might mean in the hands of governments. But eventually you couldn't keep science a secret. There were too many people who could figure out what was going on. And so they did and so the idea of a conspiracy of scientists, that scientists would basically unite amongst themselves to keep nuclear science away from others, collapsed. And what we had was that this coincided with the beginning of World War II. And as scientists started to think about the chain reaction, the impulse to make nuclear weapons and to think about nuclear weapons became overwhelming. And so very soon people started to think about what they called the super bomb. The idea of actually building a nuclear weapon. And it became very clear from the beginning just what a nuclear weapon would actually do if one could be built. And so as early as 1940 two German physicists who were refugees in England wrote a secret memo to the British government explaining the fundamental scientific principles of an atomic bomb and explaining in great and accurate detail exactly what a nuclear weapon would do if it was used. And they talked about how it would produce an explosion that could probably destroy the center of an entire city. Which is in fact exactly what happened when the bomb was built and used against Hiroshima and Nagasaki in 1945. They also pointed out that, and I quote: "some part of the energy set free by the bomb goes to produce radioactive substances and these will emit very powerful and dangerous radiations. Even for days after the explosion, any person entering the affected area will be killed. Some of this radioactivity will be carried along with the wind and will spread the contamination several miles downwind. This may kill people, and that the bomb can probably not be used without killing large numbers of civilians." And it was stunningly accurate, because this is exactly what happened when the bomb was built and used. It's a sense that...but because it was a secret memo, it only was read by a small handful of people in the British government and then eventually passed to the American government. That the process of having an informed decision about whether we actually wanted to build and use a weapon like this never took place. A small group of people decided that it's war time, whatever we have we're going to use, so we're going to run with this. And one of the people who worked on the British bomb program later on wrote about this feeling, about what the scientists realized when they actually saw that governments were going to move forward with making nuclear weapons. He said "I remember to this day what it felt like" when he realized that nuclear weapons were actually going to happen. "I had many sleepless nights. I had then to start taking sleeping pills. It was the only remedy. I've never stopped. It's been twenty-eight years and I've never missed a single night." But Britain didn't have the resources to make nuclear weapons and so the British encouraged the Americans to make nuclear weapons. And the Manhattan project was born in the United States and it was this vast scientific, technological and bureaucratic project. It was a—six hundred thousand people worked on the bomb project. And it was so secret that most of Congress didn't even know about it. And the vice president of the United States at the time, Harry S. Truman, wasn't told about it. And yet it was at one time six hundred thousand people. And scientists who were involved in the bomb program itself started to worry about if the United States succeeds in making a bomb, what happens? And one of them actually wrote a memo to President Roosevelt in 1944 trying to explain to him that if the United States actually builds and uses a nuclear weapon and tries to keep it for itself, then it will trigger an arms race as other countries seek to also have nuclear weapons. And he said that what we are in danger of is creating a perpetual menace to human security. A "perpetual menace." So this was written in 1944. And so here we are and that menace is still with us. And it's in part because all of these efforts by the scientists were to work through proper channels. They tried to advise their decision makers; presidents and prime ministers and ministers of defense and secretaries of state about the dangers of nuclear weapons, what nuclear weapons might mean for the future of the world and each time these memos would disappear into the process and the imperatives that the policy makers had were different. And so the process would go on despite what the scientists were trying to advise. And scientists realized that their words were falling on deaf ears. And some of them started to think about going public. And so one of the most important instances of the going public was after the bombing of Hiroshima. President Truman made a public statement about what the United States had done and in this he explained the nature of nuclear weapons and threatened a reign of ruin on Japan the like of which the world has never seen. And so in 1946 Pauling joined with Leó Szilárd who had discovered the nuclear chain reaction and Albert Einstein and others to create the Emergency Committee of Atomic Scientists to educate the public about the dangers from nuclear weapons and the coming nuclear arms race. Now you can't imagine how significant a step this was for the scientists to go public in this way, to decide that it's not enough to advise policy makers and presidents and decision makers but that the democratic process needs to be at the central part of the struggle over nuclear weapons. And so they issued a famous manifesto, a letter, and it marks the end of one era and the start of a new era in the relationship between scientists, governments and people on the issue of nuclear weapons. And this is the one that says "there is no secret and there is no defense; there is no possibility of control of the danger of nuclear weapons, except through the aroused understanding and insistence of the peoples of the world." And it said, and I quote: "We scientists recognize our inescapable responsibility to carry to our fellow citizens an understanding of the simple facts of atomic energy and its implications for society. In this lies our only security and our only hope – we believe that an informed citizenry will act for life and not death." So put simply then, for the scientists only an informed and active democracy stands between humanity and nuclear disaster. Not the wisdom of presidents or the decision-making capacities of governments. Now for many scientists and especially Pauling, this was the call to arms, the call to action to mobilize and organize both the scientific community and citizens around the world to make this insistent demand for the elimination of nuclear weapons. And it was an amazing movement. It was the first truly global social movement. There were petitions and demands and marches across the world in favor of this. And I think that one of the things that we have to think about is that it didn't work. Much as we would have liked to have ended the story that Einstein and Pauling and Szilárd and all these giants of twentieth century science went around educating citizens to do the right thing. It didn't work, despite their best efforts. And it's no surprise that by the mid-fifties there's a famous observation by a group of scientists that organized the Pugwash Movement of scientists of which Joseph Rotblat was one of the pioneers and one of the people who won the Pauling Legacy Award. In 1955 they had issued a manifesto themselves in which they had warned about the failure to act despite all these efforts, to do something about nuclear weapons. And they said "we have found that the men who know most are the most gloomy." But we've tried everything and that "the men who know the most are the most gloomy." And so in a funny sort of way, this is where we are now. That our failure to advise governments to do the right thing or to mobilize the public to put democratic pressure on governments to do the right thing, both of those were tried in every possible effort, with every possible energy, with enormous creativity, and where are we now? The Cold War came and went. There are still, as I said, tens of thousands of nuclear weapons in the world. And the aroused and insistent public opinion that the scientists had hoped for is not to be seen anymore. For most people the nuclear weapon's danger has just gone away. It doesn't figure in their daily lives and the fear of nuclear war has disappeared from their consciousness, but the bomb has stayed. With the end of the Cold War there was some progress. It's not that it's only been bad news. The number of nuclear weapons has fallen dramatically. There was in 1996 a Comprehensive Nuclear Test Ban Treaty to ban the testing of nuclear weapons. The United States was crucial in negotiating this treaty, but then the senate refused to ratify it. This is a 1996 treaty; it has still not been ratified. And the United States, even though it signed the treaty, keeps the nuclear weapon test site at Nevada in a state of readiness to resume nuclear testing. It's required by law that they should be able to resume nuclear testing if the president orders it. So Russia signed and ratified the Comprehensive Test Ban Treaty. So did Britton and France. China says it will ratify the treaty only if the United States does. And so apart from the United States and China, who are the other holdouts on this treaty? The answer is India, Pakistan, Israel, Iran and North Korea. This is the company we keep. The other thing is that to make a nuclear bomb, to make a nuclear arsenal, you need either highly enriched uranium or plutonium. These are the nuclear materials in nuclear weapons. These are what sustain the chain reaction. So there's been an enormous effort over many decades to ban the production of these materials as a way to control the nuclear arms race, and twenty years ago the General Assembly of the United Nations passed a resolution calling for such a treaty. They haven't even started talks on this treaty yet. And most recently the reason why there haven't been talks has been Pakistan. Pakistan says India has more of these materials, so can make more nuclear weapons, so we can't talk about a ban on making these materials. But the idea that Pakistan by itself can stop an entire international diplomatic process strains credibility. It really does. And at least for the last thirteen, fourteen years, the reason why Pakistan has been able to stop progress on moving towards a treaty to ban the production of these materials for nuclear weapons is because since 9/11, the war against Al Qaida and the Taliban has been more important than worrying about making material for nuclear weapons. So the United States says that in our relationship with Pakistan the most important thing is having them cooperate over Al Qaida and Taliban, so we won't talk to them about stopping making nuclear weapons material. So they don't. So Pakistan doesn't. So the stockpile keeps growing and the United States now says publicly that Pakistan has the fastest-growing nuclear arsenal of any country in the world. And at the same time we worry about the rise of the Jihad, of radical Islam, of Pakistan falling apart, and yet this is not a priority agenda item. So one of the things that I work on and that the people that I work with at Princeton work on is how to make progress on this agenda of ending the production of nuclear material for weapons, and, as Joseph mentioned, the International Panel on Fissile Materials, of which I'm a member. So this was founded in 2006 and we have members from eighteen countries now. These are scientists and policy experts, former diplomats, and we try and figure out how to get movement on this. And one of the things we've done is to actually draft what we think the treaty should look like, as a way to get diplomats and policy-makers to focus on this issue, so that the day that they're ready to negotiate, they don't have to start from zero, but they actually have something at least to work with. And the driving force behind this panel is Franklin von Hippel, a Princeton physicist and a quintessential citizen-scientist in the Pauling tradition. Frank is the reason that I am at Princeton. That's the reason I stayed at Princeton. But he writes academic papers, he writes op-eds, he organizes scientists, he takes part in demonstrations just like Pauling, briefs policy-makers around the world, and inspires generation after generation of young scientists; that this is part of the responsibility of scientists, to go out there and actually figure out what needs society has and to speak up for the common good and the public interest. But in terms of the prospects of where we are, things, as they said back in 1946, "those who know the most are the most gloomy." So let me end by telling you what the challenges are today. The United States under the Obama administration has committed to a massive, long-term modernization of the U.S. nuclear weapons complex, and to the weapons—it's now called the Nuclear Enterprise, by the way. They don't talk about nuclear weapons and missiles; they call it the Nuclear Enterprise, the massive modernization of the Nuclear Enterprise. So it's part of this plan. The Obama administration has announced that the goal is to spend three hundred and fifty-five billion dollars over the next decade on nuclear weapons. And if you break it down per year that will be a larger amount per year than the peak of the Cold War spending on nuclear weapons. So this modernization plan includes replacing all the intercontinental ballistic missiles, all the submarine missiles, building a new generation of submarines, and building a new generation of long-range bombers to carry bombs. The total cost by the time all of these new systems will be finished and deployed will be one trillion dollars. And it's going to take thirty years to do. And an intercontinental ballistic missile and a nuclear submarine actually lasts a really long time. The ones that we have now, some of them actually are already forty years old. They're still in service and doing fine and they'll last at least another ten or fifteen years. So when you think about the new ones that are being planned to be built and that will enter service around 2030, and they will last forty or fifty years from that point, we are talking about having nuclear weapons around the year 2080. Pauling would be a hundred and eighty years old in 2080. And so the idea that the nuclear century is going to basically become two centuries is the prospect that we face. And some American politicians have already embraced this as what the future is going to look like. So Hillary Clinton, when she was still Secretary of State, soon after President Obama gave his speech in Prague about the moral responsibility, the world free of nuclear weapons, she said, and I quote: "our goal is of a world someday in some sanctuary free of nuclear weapons." So Hillary Clinton gets ready to run for president, we have Secretary of State John Kerry. In his confirmation hearings, and this is amazing that nobody reported this as one of the things that Kerry said in his confirmation hearing, but it's there. Kerry was asked specifically about eliminating nuclear weapons, the Obama agenda at Prague, and Kerry said, and I quote: "It's worth aspiring to but we will be lucky if we get there in however many centuries." So, however many centuries. So when people like Hillary Clinton and John Kerry talk about someday in some century or however many centuries, what it actually says to anybody who is listening is that nuclear weapons are here to stay forever, as far as people like this are concerned. This is not going to be a policy issue in which they're going to engage. They are, as I said, in danger of becoming a perpetual menace to human security. Now the dangers are great and perhaps nowhere greater than in South Asia between Pakistan and India. They're the only two countries with nuclear weapons that have actually fought wars against each other, including after they tested nuclear weapons. But even in South Asia there are citizen-scientists in the model of Pauling and Frank von Hippel. And it's been a great privilege of mine over the years to work with some of them on these issues, and especially Pervez Hoodbhoy and Abdul Hameed Nayyar, who are colleagues of mine from Islamabad. They have been warning their citizens, fellow citizens in their country, about the dangers of going nuclear for now thirty years. And like Pauling in his time, they've been denounced and castigated and confronted by authority and by nationalists that our country should be as strong as possible, we should have as many nuclear weapons as we want, why are you saying that these weapons are a danger? And we have Indian colleagues too, who have argued against nuclear weapons in their own country, and I've been fortunate to work with all of them as part of the program at Princeton. But the future of the nuclear arms race between Pakistan and India is no longer just about them anymore. Even though they have a history of war and their nuclear arsenals are growing, the fact of the matter is that today Pakistan and India are trapped in the emerging struggle between the united States and China over who is going to be the great power of the twenty-first century. The United States is trying to recruit India to balance the rise of China. A new strategic partnership is being created. The Chinese have long been military and political allies of Pakistan, so they are arming Pakistan. So what we have is the beginnings of a repeat of the old Cold War sensibility: I arm my ally, you arm your ally and they will fight. And there is reason to believe now from recent scientific work that nuclear war in South Asia could have global consequences, far worse than anybody could have imagined. So people have been using the most modern climate change computer models to try and explore what would happen in case of a nuclear war. And in the history of the world nuclear weapons have been used in warfare only twice, and it was one bomb each time. One bomb in Hiroshima, one bomb in Nagasaki. But that was all the bombs that they had at the time. Even though President Truman threatened a reign of ruin, in other words we're just going to keep dropping them as soon as we make them. In the case of Pakistan and India, they may already have a hundred nuclear weapons each. So people have started to look, what happens if there is a nuclear war between Pakistan and India where they actually start using a significant fraction of the weapons that they have. So Allen Robock and Brian Toon and others have used these climate models to ask the question: imagine Pakistan and India use fifty weapons each out of the hundred each that they have and they will target cities in each other's country and cities will burn just like Hiroshima and Nagasaki burned. So what happens when you have so many burning cities? And the models showed that the smoke from the burning cities would rise very high into the atmosphere and actually spread, covering the sky, and over most of the world, and that the absorption of the sunlight by the smoke and the soot from these burning cities would trigger a global cooling that would persist for more than twenty-five years. A global cooling that persists for more than twenty-five years would trigger a collapse in the global average temperature. So, average temperatures would be at their coldest compared to the last one thousand years. I mean we worry about global warming; this is a repeat of the old fear of nuclear winter, but using the most sophisticated modern climate models that we have. And there would also be massive loss of the ozone in the atmosphere. And so their studies have concluded that this combination of nuclear winter and ozone loss would trigger an enormous global pressure on food supplies and produce what they call a global nuclear famine where there would be a massive failure of rice growing in China, wheat production and other kinds of basic foodstuffs across most of the northern hemisphere. And this is only from fifty weapons each, where as I had said there are seventeen thousand nuclear weapons in the world. And so we face a situation in which those who know the most are the most gloomy. And the situation has really reached a point where the gap between knowing what needs to be done and our capacity to actually do it has perhaps not been as large as perhaps since the day that the emergency committee of atomic scientists in 1946, when Pauling and Einstein and Szilárd tried to warn the world about what we were getting ourselves into. So I think this is where I have to take off my scientific hat and say that science has no answer to this question now. We tried keeping it a secret, we tried advising governments, we tried arousing citizens and none of it has actually managed to achieve the goals that we recognize need to be achieved. And so I think where we are today in the enduring legacy of Pauling is that the struggle against the bomb certainly needs scientists, but scientists can only be part of the struggle. The answer to the nuclear danger has to come from a larger, more collective conversation about who we are and what kind of world we want to live in and what we're willing to do about it. So with that I'll stop, thank you very much. Question: Can you reflect on positive aspects on nuclear disarmament currently happening? Zia Mian: There are efforts that are being undertaken and one effort is, as you say, this new mobilization on the humanitarian impact of nuclear weapons. So let me explain the context. So, a few years ago antinuclear activists were able to convince the Red Cross to ask the question "so what happens if nuclear weapons are used? Could the Red Cross actually cope? Could it help?" And the Red Cross thought about it and said "no." And so the Red Cross got together with other UN, United Nations agencies and governments that were interested in thinking about this question, and in 2013 there was a conference in Oslo on the humanitarian impact of nuclear weapons where the Red Cross and the United Nations aid agencies and a hundred and twenty-eight countries, there are about a hundred and ninety countries in the world, a hundred and twenty-eight of them came together with the UN and everybody and agreed, yes, that the humanitarian impact of nuclear weapons would be catastrophic beyond measure, that we couldn't expect to cope and so we should get rid of nuclear weapons. And there was a follow up conference in February of this year in Mexico and a hundred and forty-six countries came. So we've made progress from a hundred and twenty-eight to a hundred and forty-six. And the conclusion was the same: catastrophic effects of nuclear weapons would be so great, and so great we couldn't hope to cope, so we have to get rid of nuclear weapons. The countries with nuclear weapons stayed away. And the most troubling absence of all this was of course the United States, especially after what Obama said in Prague about the use of nuclear weapons and American moral responsibility. It's as if Washington had just forgotten that Obama ever made the Prague speech, and about the global consequences of nuclear weapons and the moral responsibility and what needs to be done. And the fact of the matter is that it's true that a hundred and forty-six countries got together and said yeah, use of nuclear weapons would be catastrophic, but there are only a handful of countries in the world with nuclear weapons. And it's important to remember all the other countries decided they didn't want nuclear weapons or need nuclear weapons, and yet they have failed to get the ones with nuclear weapons to give them up. And so the second part is that we've known about the catastrophic consequences of nuclear weapons from the beginning. Scientists wrote about the catastrophic consequences even before the first nuclear weapon had ever been made. As I said, they wrote a memo in 1940 saying "this is what will happen if we make this and use it," and he was pretty catastrophic in his description. And so one thing we've learned is that terrifying people about nuclear weapons captures their attention, but beyond a certain point it doesn't translate into the kind of political outcome that we need. And much of the effort that Pauling and others tried in the fifties and the sixties, and that people tried again in the eighties, was to say that nuclear war would be so bad, fallout would be so great that we just can't live with these things. They managed to convince most people that yeah, nuclear weapons are really, really bad. If you ask anybody they'll tell you nuclear weapons are really, really bad. But there are still seventeen thousand nuclear weapons in the world. So knowing something is really, really bad has not translated into this. And now we see actually that we are going through the same process with climate change. Most people understand that climate change is going to have enormously damaging consequences for humanity and for nature, and yet we continue to fail to create the political process that will actually grapple with this. So there's a break. That's part of what I'm getting at, there's a break between what we need to do and what we know we need to do and our capacity to actually do it. The process that connects people to the political decisions that are made in their name has broken down. Nuclear weapons was the first great example. Climate change may be the second great example. And I don't know whether we can survive either of those examples. Question: What is the role of the artist in nuclear disarmament? Zia Mian: That's a—it's a good question. The way scientists tell a story about the nuclear age, the way that I did, talks about the scientists. But they weren't the only ones that were troubled by the threat of nuclear weapons. If you go back to 1945 and 1946 you find that George Orwell wrote about the dangers of nuclear weapons, Mahatma Gandhi wrote about the dangers of nuclear weapons, Albert Camus wrote about nuclear weapons, Lewis Mumford wrote about nuclear weapons, all kinds of people, writers, poets, artists, they said this looks really, really bad. And if you fast forward to the early 1980s and the Reagan period and what was called the Second Cold War, the giant nuclear freeze movement in the United States and the movements for nuclear disarmament in Western Europe. In the middle of this came the famous movie The Day After, about the terrible consequences of nuclear war, set in Kansas. It did shock the American public about this is what nuclear weapon war would look like. And Ronald Reagan himself claimed that this movie changed his thinking about nuclear weapons, along with the demonstrations of hundreds of thousands and millions of people against nuclear weapons. But Regan went to Reykjavik, he met with Mikhail Gorbachev, they looked into each other's eyes. They talked about the shared vision of the elimination of nuclear weapons. They disagreed over Star Wars and missile defense, and that was it. So the role of culture and communication in capturing the imagination has been very important. But unfortunately it's had the same kind of—it's experienced the same kind of challenge as the more traditional scientific approach, to turning a way of thinking and a way of understanding nuclear danger into a political outcome that is desired. And so I'm not saying that I know what the answer is, I wish I did. But I think we have to start by recognizing that the things we've tried haven't worked and we have to be honest about this. Otherwise we're just going to keep doing it and not be surprised that nothing changes. So we need new ideas. We need new people to think about new ideas. We need a new process, and it's not just about nuclear weapons, it now is increasingly about taking control over decision making. How what people want can be organized into a way that actually has political effect, because on more and more issues, we're not getting that. And so we need to recognize that that traditional notion of how politics works, that once a majority of the public believes something then it becomes policy, it just doesn't work like that. And we have to start with this, and unfortunately artists and other kinds of cultural communicators have run into the same brick wall that the scientists have had. Question: Why should I consider taking action for nuclear disarmament with such overwhelming odds against success? Zia Mian: So, three reasons. One is that being gloomy does not mean that I despair, because despair is not an option. The idea of giving up on humanity is not an option that we have. So you can be gloomy and I am gloomy and I want other people to be gloomy, but the gloom is not meant to be a path to despair, it is meant to be a path to self-realization that look, what we've done doesn't work so then what? Admit that I don't know. A little humility can go a long way in this. The second reason is that there are people who need us to figure stuff out. One has to remember that people like me and people like you and people in the United States in rich, advanced, developed countries with universities and lots of access to resources, both intellectual resources as well as economic resources, are some of the most privileged people in the history of humanity. If we cannot take up this responsibility, then who can? So you may be gloomy, you may even want to despair, but you can't because other people need us to pick this up and figure out how to go forward. So you have to do it just because it has to be done, and if we don't do it, there are other people who can't. The third reason, I think, is that there is a legacy issue here, and that is that the number of problems that we have accumulated over the twentieth century that we are leaving for the future of humanity to contend with are becoming increasingly a burden for any possibility that the generations that will come after us will have any capacity to actually cope. We have thrown so much stuff at the future and that's what I meant about "the scientists have the future in their bones." We constantly look at the future and you think so we're going to leave them seventeen thousand nuclear weapons? Two thousand tons of nuclear weapons materials sitting in the world? An atmosphere full of carbon dioxide? Radioactive waste that will be active for tens of thousands of years? Poisoning of the soil and the water? We just did it, and unless we fix it, their capacity, they being future generations, their capacity to have any control over their lives will be so constrained by what we have left them that it is a grievous, grievous thing that we've done, that we do to the future. And so it's not just people today that we owe this to, it's the future that we owe this to. So all three of those things mean that you have to be gloomy, you have to be realistic, but you have to take responsibility and try and figure out what you can do, because it has to be done. Question: Will nuclear modernization be stopped by military budget cuts advocated by groups like the Tea Party? Zia Mian: It's true that coming up with a trillion dollars to spend on nuclear modernization is asking a lot, but most of the pressure for the nuclear weapons modernization is coming from the republicans, including from the tea party. Audience Member: But I mean also when President Bush was in office many of these ideas were put forward and then were blocked because there wasn't money in the budget to do so. Zia Mian: Right. But this is the dilemma, that the block has historically come from the democrats. What we have now is the Obama administration seeing that this is what they have to do and the republicans, even the tea party except for very few people on the edges of the Tea Party actually want to see more military spending, and including spending on nuclear weapons. And so the idea of a coalition of fiscal conservatives and more progressive-minded people to kind of curtail this modernization of nuclear weapons, it flies in the face of the actual coalitions that we see; that have been developed on the ground on these kinds of issues. The things that may eventually derail this, and I'm not saying that they will derail this, but the things that may derail this is that within the military itself there is a concern about what kinds of resources they will need going forward, for what purpose, and that sits outside the debate that we're having about what fiscal conservatives may or may not want. They're from the point of view of the military, there is an issue about the future utility of nuclear weapons that they see, and we've seen signs of what this is like all the way from the top down to the lowest ranks of the military that deal with nuclear weapons. You may have seen the reports of the missile launch officers, the people who sit underground with the keys to launch the intercontinental ballistic missiles, cheating on their exams in a systematic way over years and years and years, or the air force crews that inadvertently loaded six live nuclear arm cruise missiles onto a bomber and then the bomber flew across the United States without anybody knowing it was carrying nuclear weapons. Because they were just going through the motions of checklists and so on, or senior officers in the military charged with nuclear weapons not exercising good conduct, and most recently the fact that even within the nuclear weapons complex laboratories, the actual design drawings of nuclear weapons with all the components, so if you have to take out a fuse to replace it, you know exactly what fuse to replace it with; they're not complete in some cases. They can't track down what actually happened, so there are incomplete drawings, missing pieces, etcetera, so this was just surfaced a couple weeks ago in an investigation. That there seems to be a crisis across the board that the people who work with nuclear weapons on a day to day basis see these things as not actually being that important because they're not actually being used and there's no sense of overwhelming urgency and threat like there was during the Cold War. This is also the recipe, though, for something tragic happening. And that's not what we want to see, the path to nuclear disarmament shouldn't come after a terrible catastrophe. So there are these problems that we face, but the issue that we need to focus on is the larger one that as the United States commits to a multi-decadal modernization in principle of its nuclear weapons, you can imagine the same debates taking place in Russia, in China. Britain is struggling to think about the future of its nuclear weapons. So are the French, and you can imagine that Pakistan, India, North Korea, Israel, the idea of having a debate about should we keep our nuclear weapons or just give them up just stops happening when you see that oh in principle the Secretary of State of the United States says we'll have nuclear weapons until some centuries, so let's not talk about nuclear disarmament. And so the possibility of having those kinds of political discussions stops altogether. And that's the problem. Not so much the accounting specific sums of money, year to year allocations, because those can always be changed. Question: Would it help the cause of nuclear disarmament if violence were defined as a public health issue? Zia Mian: One of the things I mentioned earlier in my talk that has disappeared from the kind of agenda that most citizen-scientists in this larger debate, which is increasingly focused on nuclear weapons, has been the central issue of war itself, as Joseph mentioned at the beginning. So you have to remember that the scientists in the late 1940s actually, when they talked about the need for eliminating nuclear weapons, also talked about the need for an international authority to end the use of force between states and to end war. Now the charter of the United Nations specifically begins with this commitment and this obligation. It says "to end the scourge of war." And the charter specifically forbids states from threatening or using force against other states. So in terms of the organization of the international system, the principles that we all agreed on, that all countries agreed on through the charter of the United Nations; we actually banned war already. We all agreed that this charter says you will not do this. We all agreed to this, so we banned war, and yet we didn't. Again, so this is the dilemma that the answer was transparent, the institutional process was created and yet it still continues. And so when you talk about violence and so on, what's...we need to think about is that how would we do this in a way that we haven't tried it already? One of the most important decisions ever made by the United Nations is Resolution 1.1. The very first resolution ever passed by the General Assembly of the United Nations, January 1946. They met in London and Resolution 1.1 calls for a plan for the elimination of nuclear weapons. It was the first thing on the agenda of the newly formed United Nations. And they all agreed, yes we need a plan. No plan. Even today, no plan. And so we tried. We tried setting up an institution, we tried convincing governments, we tried mobilizing the people, and so we need new ideas. I think that one of the things that it may be required is that—the scientists themselves saw themselves as part of a global community, not as people who were nationalists committed to a particular defense of their own country against others, but part of a global community that tries to protect the global human community. Now that is a sensibility that actually hasn't taken root in the kind of ways that one would hope to. The sense of a global requirement to engage in this process. And in the period where we are today in the twenty-first century, it may be that new global sensibilities are emerging that might open a path to the kinds of participation among people and arriving at a common wisdom of common understanding as to how to go forward that goes beyond a commitment first to nationalism and to your own. So that gets in part to your question about our violence versus your violence, our terrorism versus your terrorism, our bomb versus your bomb, that if we start from the principle that all nuclear weapons are created equal, you might actually be able to make some kind of progress. But these are questions where you need political scientists, you need artists, you need anthropologists and philosophers and ordinary people of all kinds to take part in this kind of discussion. And it's not something now, as I said, the citizen-scientist has to step aside and we need a new kind of dialog about what it means to be human and to whom are you responsible and how is this responsibility to be exercised. Question: Does the principle of mutually assured destruction work in the context of Pakistan and India? Zia Mian: This is a debate that takes place a lot and the answer, one answer, is how many people's lives are you willing to bet on the outcome? Because that's what it is. There are a hundred and eighty million people in Pakistan, 1.2 billion in India. If they use fifty nuclear weapons each and blacken the sky and create a global nuclear famine, it'd be too late to say "sorry, I was wrong about mutually assured destruction." And so it's a big bet on an idea. The second part of it, though, is that if historical experience is worth anything, and it's worth something, at least, one is that the United States and the Soviet Union were actually allies before they were enemies. And that even during the Cold War there aren't many instances where they actually shot directly at each other, whereas in the case of Pakistan and India, within a year of independence they went to war. Then they went to war again in 1965, then they went to war again in 1971 and then after both of them tested nuclear weapons in 1998 they actually went to war again. And during the crisis and the war in 1999, one year after the nuclear tests, leaders on both sides hurled nuclear threats at each other on a terrifyingly frequent basis. So the idea that they would just threaten but not act; one could hope that they would be restrained but one would hope their restraint would also carry over in just threatening to use this kind of stuff. And so the people who've studied nuclear history the most often end up by arguing that the only thing that saved the world from nuclear war during the Cold War was good fortune, as opposed to strategy. And these are people like Robert McNamara and people who saw the Cold War close up, or General George Lee Butler who was the commander in chief of—commander of Strategic Command at the end of the Cold War. So these are the kind of people that were responsible for thinking about waging all-out nuclear war and their judgment was not strategy, but luck. And I think one can't base one's judgments on the hope that a strategy will work when the costs are potentially so grievous that one could never accept the losses that would follow. Question: What are your views on nuclear energy? Zia Mian: So historically this has been one of those things that actually divided the scientists over time. In part because some of the same scientists that were responsible for coming up with the idea of nuclear weapons and building them wanted something good to have come out of all the work that they did in discovering atomic science and nuclear physics and nuclear engineering and so on. And so the hope was, as Szilárd talked about, either producing energy on an industrial scale or atomic weapons. And I think one of the lessons that we've learned over the last seventy years or so is that the line between nuclear energy and nuclear weapons capability is not really a line at all. And so one can phrase the debate in nuclear energy in terms of energy and climate change, et cetera, or even safety, after Fukushima in particular. Or one could also take into account the proliferation dangers that we see with nuclear energy and the debate of Iran has brought this to light in a very clear and telling way, where the kinds of nuclear capacity that Iran is trying to build are the kinds of things that Japan has, Germany has. They have uranium enrichment centrifuges and so on. And so, and yet in the case of Iran we're petrified that this is a potential nuclear weapons crisis in the making. And so the realization that this is actually—that there is such an overlap in these technologies and that the thing that stands between nuclear energy and nuclear weapons capability is political decision making, not a technological absolute, means that if you decide to pursue nuclear energy as a large-scale energy choice going forward, then it means you are willing to live with the risk of proliferation, and that's a big risk. And I think that a large part of the debate about nuclear energy and climate change misses out on this dimension. This is a dimension that some of us worry about a lot. And so I think that for many people nuclear energy is the last possible, worst option, when all else has failed, given the risks that it carries of proliferation, accidents and a fundamental problem with accountability. I mean one of the things that you have to remember is that electricity may be nuclear, you turn on the light switch and the light comes on, but if something goes wrong then—even today, after three decades since the Chernobyl accident, people are still not allowed back into the zone that was evacuated. After three decades. And so the idea that you would have such a massive and enduring impact on people's lives like this, just to be able to turn on the light, is actually a big cost to impose. And so I think the debate about nuclear energy needs to be more balanced. One can see the imperatives of climate change but the debate is largely, I think, wishful. What we want is a technological solution to what is fundamentally a political and social problem. That is you have a set of expectations about our right to consume, and we want a magic bullet. And the world doesn't work like that. And so, like nuclear weapons, we want to be safe, and nuclear weapons for some offered a magic bullet that would guarantee that no one would attack you. It doesn't work like that. So I think that in the larger scheme of things we need to be a little more gloomy and consult our bones about what kind of future we want and what kind of future we're leaving for the subsequent generations. And when you see it like that some of these choices don't look as compelling as if you just prioritize your immediate needs here and now. So I've gone on long enough, so thank you very much.